***** DISH OF THE WEEK (Sunday-5/6/18- Walmart Supercenter). 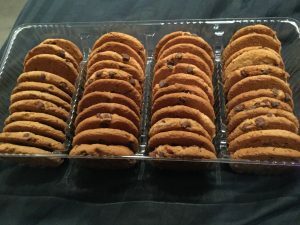 This past Friday- night while watching the latest 1-hour episode of Blue Bloods- Jeff Eats and Mrs. Jeff Eats somehow managed to consume an entire Family Size package of Great Value Classic Chocolate Chip Cookies- Believe me when I tell you that- we aren’t proud of that accomplishment, but what is! ***** Great Value Classic Chocolate Chip Cookies. If you like Chocolate Chip Cookies- the bet here is that you’ll like Walmart’s “house brand” Great Value Classic Chocolate Chip Cookies! Yesterday, the pictured package cost Jeff Eats $2.50 at- the Walmart Supercenter, 16205 South Military Trail, Delray Beach, Florida 33484. Now, for sure these cookies ain’t playing in Mrs. Fields or David’s Cookies’ league- but at $.05681 a cookie, Great Value Classic Chocolate Chip Cookies are a whole lot better than a kick in the teeth! Like I said 3-seconds ago…If you like Chocolate Chip Cookies- the bet here is that you’ll like Walmart’s “house brand” Great Value Classic Chocolate Chip Cookies!- I’m in! You can check walmart.com for store locations/product info.